Occasionally I’m booked for a wedding by a couple who I’d consider my ideal clients. A couple who are great company, have fantastic taste in music and are planning a wedding where they do things their own was and focus on the three F’s: Family, Friends and Fun. Kari & Pat are definitely my ideal clients! I’d met them just once before when I shot their supercool engagement session in Montreal. I’ll blog that one soon. We had so much fun on that shoot and I was definitely looking forward to their wedding, especially when they casually dropped into the conversation that they’d like to stop off at a record store on the wedding day for some photos! I started the day with the girls while my second shooter, the fantastic John Koo, got to hang out with the guys. 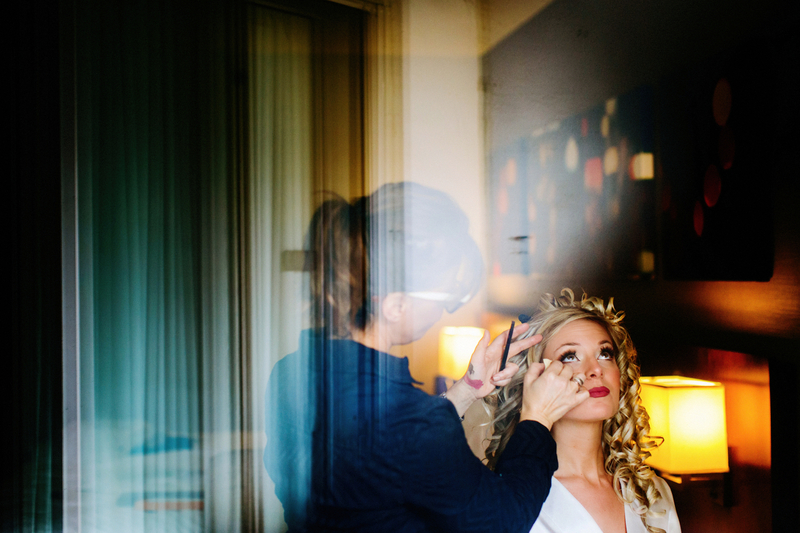 There were some very emotional moments as the girls got ready for the main event and the room was big, with plenty of light and a cool little balcony overlooking downtown Montreal. The ceremony itself was held at the breathtaking Notre-Dame Basilica. This ain’t no ordinary church folks! This is the place where Celine Dion got married. You’ll see from the photos below, it’s next level. As usual for a Saturday afternoon, the outside of the basilica was full of tourists so please send me some hi-fives for the fact that I did a big group photo outside. No mean feat I assure you. From there we did a few photos with the bridal party before heading out for portraits with Kari & Pat. We got a good mix of images using the architecture around the old port as well as some cool street art and a gritty little alleyway that I love due to its textured walls and amazing light. Then the couple jumped in their limo and we made our way to Aux 33 Tours, my favourite record store in Montreal, where the staff very kindly allowed us to shoot some photos of the bride & groom. So cool! The wedding reception was held at La Plaza on Sherbrooke, where guests were invited to sign vinyl rather than a standard guest book. Love it! Huge thanks to Kari & Pat for choosing me to be their photographer and for giving me my first opportunity to shoot a wedding at Notre-Dame Basilica. Built in the Gothic Revival style, the church is highly decorated. The vaults are coloured deep blue and decorated with golden stars, and the rest of the sanctuary is decorated in blues, azures, reds, purples, silver, and gold. It is filled with hundreds of intricate wooden carvings and several religious statues. Unusual for a church, the stained glass windows along the walls of the sanctuary do not depict biblical scenes, but rather scenes from the religious history of Montreal. If you’re planning a Notre-Dame Basilica wedding I’d love to hear from you so please drop me an email via the Contact Page. Great work Steve! What a venue!!! What a cool collection of photos!!! Loving the record shop portraits! !